In my junior year, I partnered with Sonia Murthy and Sophia Tevosyan to compete in the local science fair circuit, guided by our AP Psychology teacher Mrs. Allender. We began our project with analysis of the Intergovernmental Panel on Climate Change reports, focusing on halocarbon use and global impact over the course of the reports. 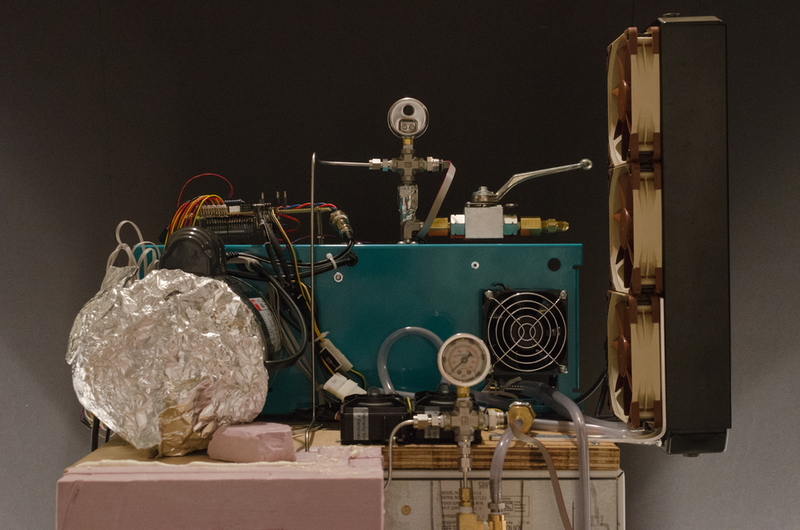 This research morphed into development of a physical prototype device with the goal of demonstrating the viability of alternative refrigeration chemicals in the domestic setting. 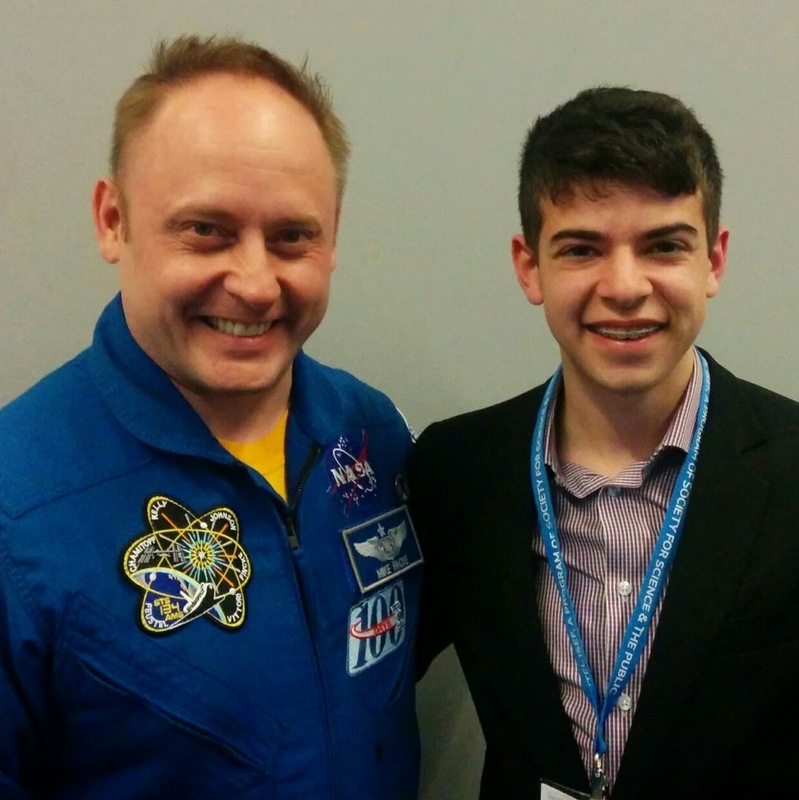 Published in the Tesla STEM Journal, 2014-2015 Edition. 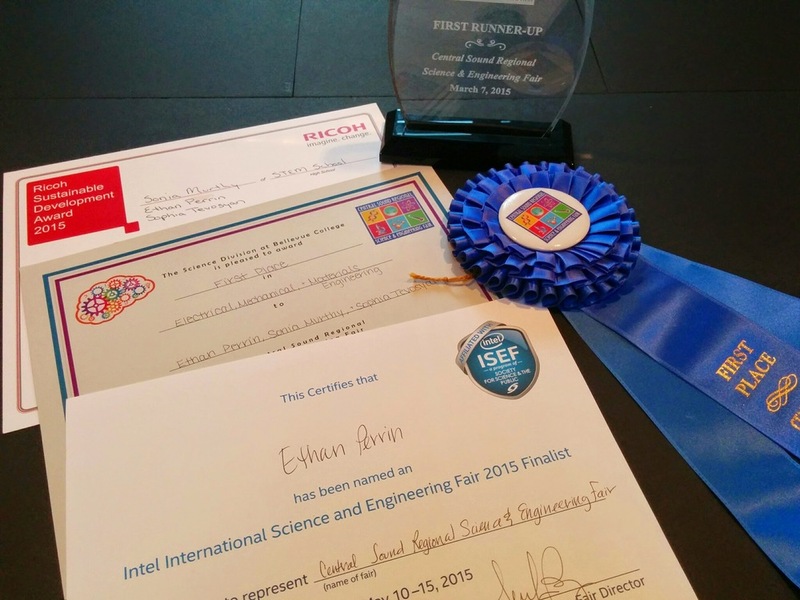 Central Sound Regional Science Fair 2015 Runner-Up Grand Champion and 1st place category prize, also receiving the Ricoh Sustainability Award. 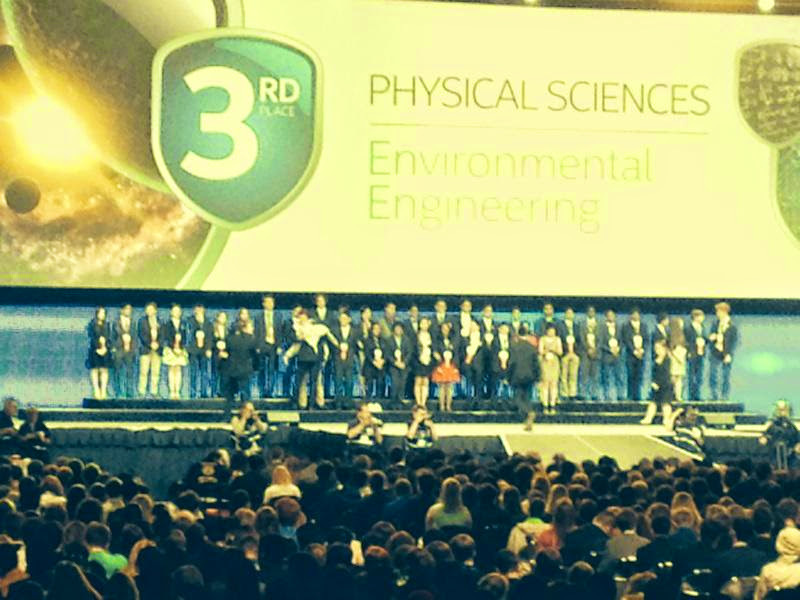 Intel International Sciene and Engineering Fair 3rd place prize in Environmental Engineering and NASA Special Award. View our exhibit board here or read the full report below. 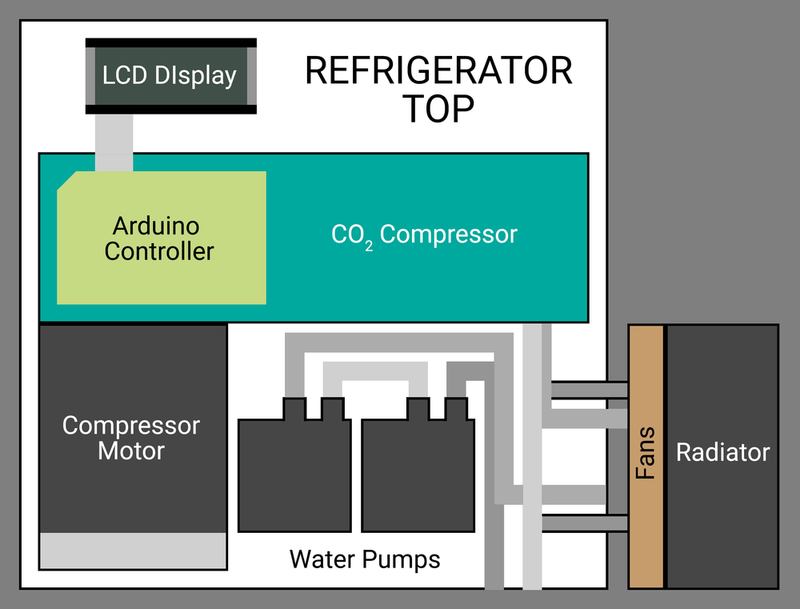 This engineering project seeks to develop a novel refrigeration system implementing carbon dioxide (CO2) as an alternative refrigerant to the hydrofluorocarbons (HFCs) currently in use in domestic settings. HFCs have increasingly gained notoriety for their high global warming potentials, which have been proven to contribute to global climate change. Utilizing a refrigerant with a much lower global warming potential, such as CO2, would thereby reduce the significant greenhouse gas contributions of the refrigeration industry to this imminent global crisis. The engineering process began with the analysis of a current HFC refrigeration system in regards to power consumption, thermal performance, and environmental impact. Metrics gathered from an existing refrigeration unit and knowledge of the chemical properties of each refrigerant were then used to establish the design requirements for a comparable CO2- based system. 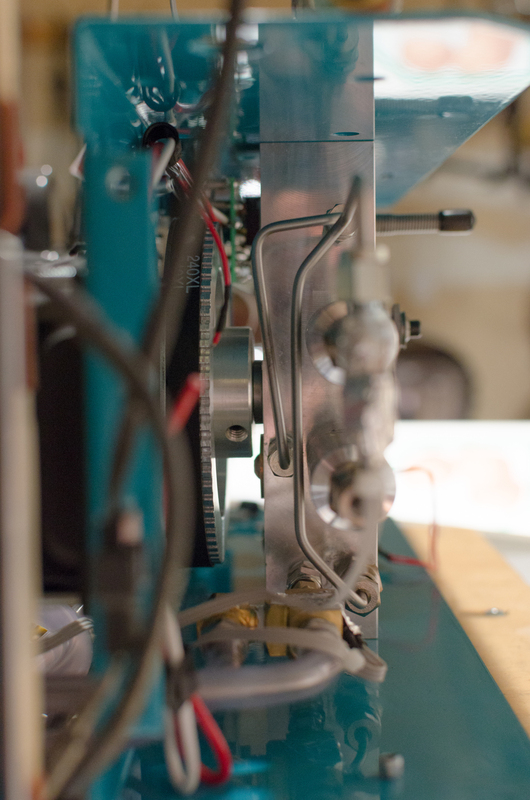 Performance data acquired from this working prototype led to repeatedly tuning and modifying the design to most closely achieve the performance of the existing HFC system. The prototype created has successfully achieved thermal performance of the preexisting system in maintaining an internal temperature of 6 degrees Celsius, proving to be a viable refrigeration technology. In terms of power consumption, the prototype operates at a net 80 watts, lower than the 90 watts of the existing HFC system as a result of the cogeneration system which recovers lost energy to heat water. With regards to the environment, the global implementation of the much lower impact CO2 refrigerant will reduce carbon dioxide equivalent emissions by more than 136 million metric tons. The history of the refrigeration industry began in the early 1920s with the synthesis of chlorofluorocarbons (CFCs) when large American corporations began seeking less toxic alternatives to the ammonia (NH3), methyl chloride (CH3Cl), and sulfur dioxide (SO2) refrigerants that had been in use since the late 1800s. CFCs were quickly praised for their nontoxicity, and gained prominence in everyday households as they began being used as an inexpensive facilitator for cooling applications. In less than a century, the growth in CFC use peaked around the world with more than one million metric tons of the refrigerant being produced annually. However, in 1974, scientists Frank Rowland and Mario Molina discovered the ozone-depleting effects of CFCs, leading to their phasing out by the Montreal Protocol. Implemented in 1989, this international agreement forced aerosol, refrigerator, and air conditioning companies to quickly begin looking for an alternative chemical to use in their products. Although less energy efficient, HFCs became an increasingly feasible option. Unlike CFCs, HFCs lack the chlorine atom that catalyzes the harmful destruction of ozone, and generally remain in a nonreactive state in the troposphere. Still, HFCs have a crucial problem of their own: they are a very potent greenhouse gas and are being used on an increasingly global scale. According to current projections, HFCs could rise to 20% of total carbon dioxide equivalent emissions, resulting in the possible addition of 100 gigatons of carbon dioxide equivalent emissions and a 0.5 degree Celsius rise in global average temperature. Although seemingly insignificant, a 0.5 degree Celsius increase could greatly contribute to ocean acidification, sea level rise, and massive storm events, damaging marine life, agricultural productivity, and security on an international scale. The implementation of carbon dioxide as a refrigerant provides an undeveloped solution to averting such detrimental crises. Not only does CO2 have a global warming potential 0.025% that of HFCs, lower than the majority of other suggested refrigerants, it is nontoxic, nonflammable, and easy to obtain. While carbon dioxide is commonly utilized in large industrial cooling devices and factory-scale refrigerators, the residential refrigeration industry has yet to develop an appliance capable of using carbon dioxide on a domestic scale. 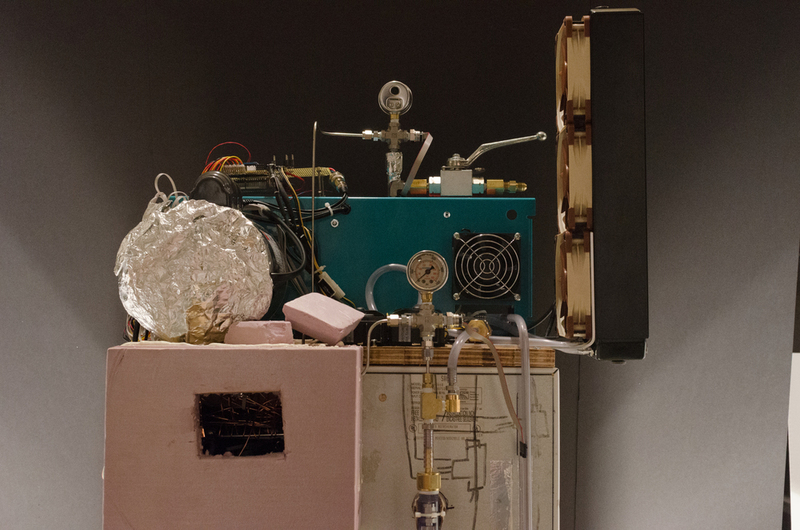 A conventional refrigerator operates by vapor-compression refrigeration. A liquid refrigerant is forced into a vapor state under decreased pressure, which is an endothermic reaction that removes heat from the environment (the inside of the refrigerator). The heat sink assembly cooled by the vaporized refrigerant provides a large surface area for thermal transfer with the air inside the refrigerator. The warmer gas now undergoes compression by a mechanical compressor, condensing it into a liquid state through an exothermic reaction that releases heat into the environment (outside the refrigerator). The evaporation process is what cools the inside of the refrigerator, whereas the condensation process is what heats the back of the appliance. In this manner, heat is continuously absorbed from inside the appliance and released at the back, pumping thermal energy between the two environments. The closed loop water pump system circulates cool water over the thin CO2 tubing responsible for condensation (see 4). In an ideal system, the water circulates throughout the house to provide indoor heating before returning to the refrigerator. 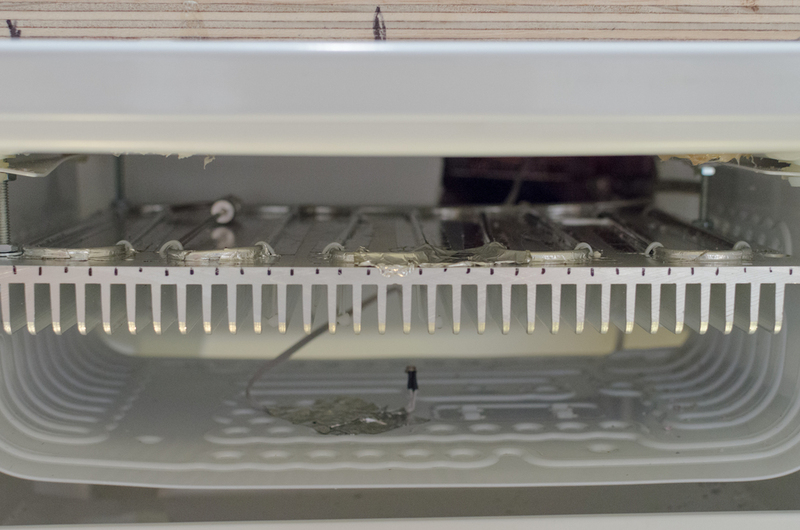 The water radiator is the final step in the water cooling process, transferring the remaining heat from the water loop to the air. 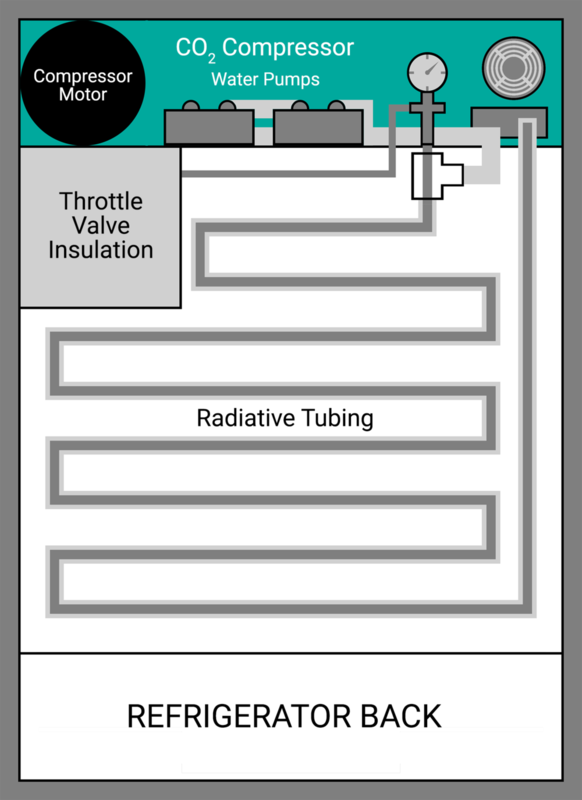 Water cooling takes place in the radiative tubing, a long loop of high pressure tubing engineered for maximum heat transfer from the CO2 to the circulating water, transitioning the CO2 to a liquid state. 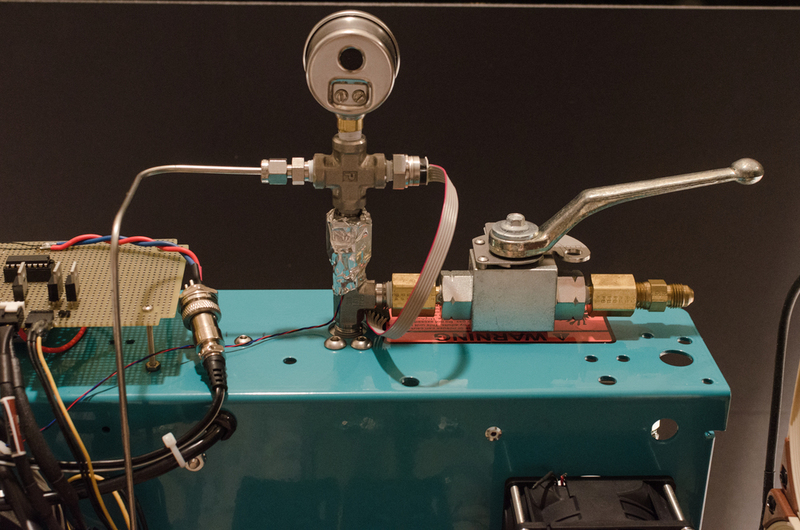 The cooled liquid CO2 enters the inside of the refrigerator, where an expansion valve and wider tubing subjects the CO2 to lower pressures, forcing it to expand into a gaseous state. A heat sink assembly inside the refrigerator cooled by the gaseous CO2 facilitates heat transfer with the air inside. After absorbing heat from inside the refrigerator, the gaseous CO2 returns to the inlet of the compressor for recompression. Pressure-enthalpy diagrams indicate under what conditions a given substance will be in a liquid, vapor, saturated vapor, supercritical fluid, or the proportions of each. Temperature lines drawn in blue also predict at what temperature the substance will be. Using these plots, the diagrams have been overlaid with functional schematics of a typical HFC-134a refrigeration system and a proposed CO2-based refrigeration system. They show how each component of the system manipulates pressure and enthalpy of the system to achieve a temperature (and/or phase change). The compressor increases pressure and enthalpy, producing a high pressure gas (2 in the HFC diagram). Cooling the fluid under a constant pressure environment in the condenser reduces the volume, and a lateral transition across the enthalpy axis results in a phase change to a liquid (3). Reducing pressure by means of a throttle has no change in enthalpy, transitioning into a very cold, gaseous state (4). Absorbing heat inside the refrigerator via the evaporator facilitating the liquid-gas phase change increases enthalpy, resulting in a warmer, low-pressure gas ready for recompression (1). The CO2 diagram operates under the same principles, utilizing a heat exchanger system to more effectively cool the much hotter supercritical fluid produced by the compressor (cogenerating hot air and water). The residential refrigeration industry is currently dominated by hydrofluorocarbon (HFC) based systems, which have long held commercial favor due to their nontoxicity, low flammability, and cost-efficient mass-production. However, the high global warming potentials (GWP) of these halocarbons (on average 1400 times that of carbon dioxide), have proven to be environmentally detrimental due to their propensity to contribute to global climate change and the associated environmental deterioration. The implementation of a carbon dioxide-based refrigeration system as an alternative to traditional HFC models would not only significantly reduce the negative effects of refrigerants on global climate health, but also the adverse implications associated with global warming. Moreover, the cogenerative functionality provided by the use of a water pump to cool the appliance would produce hot water without the consumption of additional energy. This would further reduce global warming as power plants operating on fossil fuels would lower their production rate and greenhouse gas emissions as a result of a lower electricity demand. Thus, engineering a novel carbon dioxide-based refrigeration system that acts as a cogeneration appliance has the potential to not only prevent the further degradation of global environmental health, but also to create energy-efficient and sustainable households. In order to create a refrigerator capable of operating on carbon dioxide, the appliance must be able to cool the hot supercritical CO2 from the compressor to a liquid state at a safe temperature. Generally, the back of a refrigerator includes radiator tubing that cools the liquid refrigerant as it runs through the system. However, this is not powerful enough for CO2, which can reach temperatures of up to 200 degrees Celsius. Furthermore, carbon dioxide requires higher pressures to condense than HFCs, necessitating different tubing and materials than those generally used in a refrigerator. 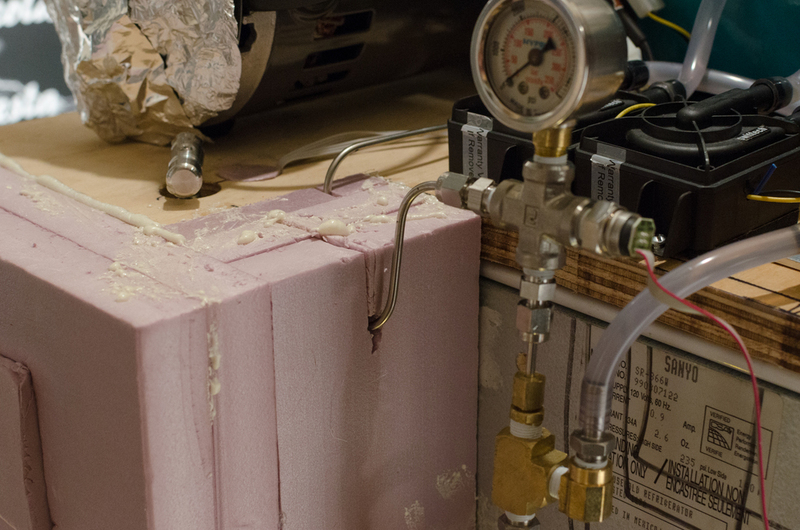 The goal of this engineering project is to design and construct a refrigerator capable of maintaining the high pressure and temperature conditions necessary to condense the carbon dioxide to usable levels as a refrigerant. 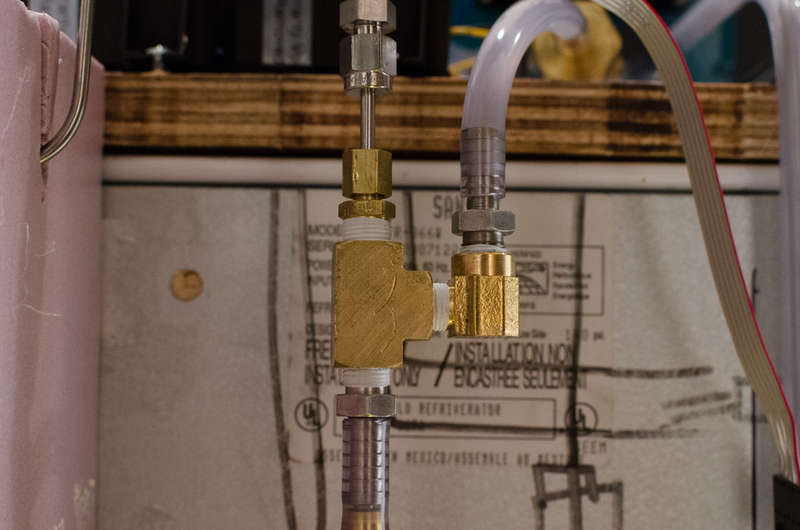 Use of a CO2-specific compressor and thick-walled tubing sustains the high pressures required for room-temperature phase changes, which are at the core of vapor-compression refrigeration. In addition, a water-based heat exchanger is capable of the thermal capacity required for rapidly cooling the hot supercritical CO2 to a liquid state, concurrently cogenerating heated air and water to potentially reduce both domestic energy use and greenhouse gas emissions. “Watts saved” calculations are based on a measured water flow rate of 120 gallons per hour and an observed rise in water temperature by 0.4 C.
The thermal performance of a typical refrigerator is higher than that of the CO2-based prototype. The carbon dioxide-based refrigerator maintained a minimum temperature of only 6.1 degrees Celsius, while the conventional HFC refrigerator was able to attain temperatures as low as -5.0 degrees Celsius. Furthermore, the cooling speed of the HFC refrigerator is around 1.7 times faster than the CO2 refrigerator, due to the lower thermal pumping capacity and efficiency of the prototype CO2 system. However, 6.1 degrees is sufficient for the short-term refrigeration of many consumer products, and a second trial indicated the possibility of reaching temperatures as low as 3 degrees. The -4 degrees reached at the throttle valve indicates there is considerable potential for a further refined CO2 system that reaches below the FDA minimum of 4 degrees. The net power consumption of the carbon dioxide-based refrigerator, at 80 watts, is 10 watts less than the 90 watt power consumption of the HFC-based refrigerator. Without taking into account the cogeneration aspect of the refrigerator, it consumes 290 watts. This is mostly due to the compressor, which consumes more than half of the 290 watts when operating under a load. Since CO2 requires a much higher pressure to condense, it consequently requires a much more powerful compressor. 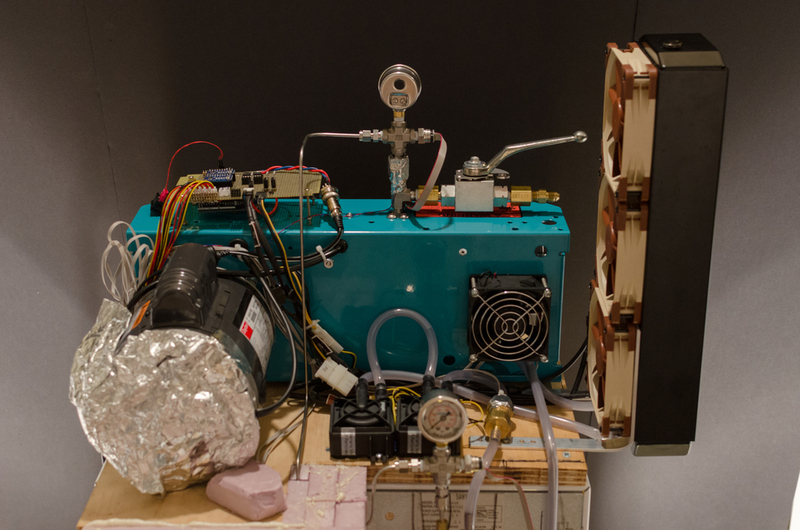 However, the prototype of the carbon dioxide-based refrigerator, due to its unoptimized nature, will inevitably use more electricity than the refined design of a mass-produced product. If implemented on a larger, commercial scale, the CO2 refrigerator could be revised and improved to reach lower power consumption. Furthermore, even the prototype is able to save 210 of the 290 watts by using them to heat water, thus offsetting electrical consumption in other aspects of the domestic setting. Overall, through its cogeneration applications, the refrigerator is able to provide for 6% of annual space heating and has a net power consumption lower than that of the HFC refrigerator. Due to its lower net power consumption and more eco-friendly refrigerant, the CO2 refrigerator’s environmental impact is much lower than that of its HFC counterpart. If implemented on a global scale, the CO2 refrigerator would release around 136 million metric tons less of carbon dioxide equivalent emissions than the HFC refrigerators currently in use. This number was calculated based on the 80 watt power consumption of the prototype - if mass produced and improved to use less electricity, the decrease in greenhouse gas emissions could reach up to 150 million metric tons. Such a notable improvement to the negative contribution of the refrigeration industry to climate change could significantly help to lessen its environmental degradation. Despite the lower thermal performance of the carbon dioxide-based refrigerator, its utilization of CO2 as a replacement for HFCs is able to significantly reduce the negative impact of refrigerants on the environment. If implemented on a global scale, the CO2 refrigerator could potentially reduce greenhouse gas emissions by more than 136 million metric tons. Furthermore, its functionality as a cogeneration appliance will reduce electricity use in other aspects of the domestic setting, providing for 6% of annual space heating demands. 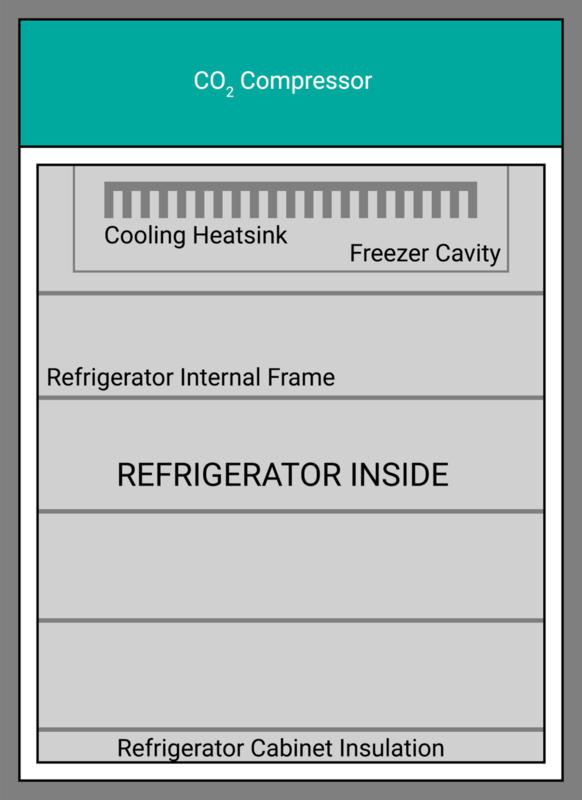 While the prototype of the refrigerator is unrefined and therefore does not operate at maximum efficiency, mass-production of the appliance with further design optimizations could both lower its power consumption and increase its thermal performance to better match that of current refrigerators. Thus, the carbon dioxide-based refrigerator is less detrimental to the environment, and has the potential to reach and even exceed the performance of current refrigerators as a growing technology. 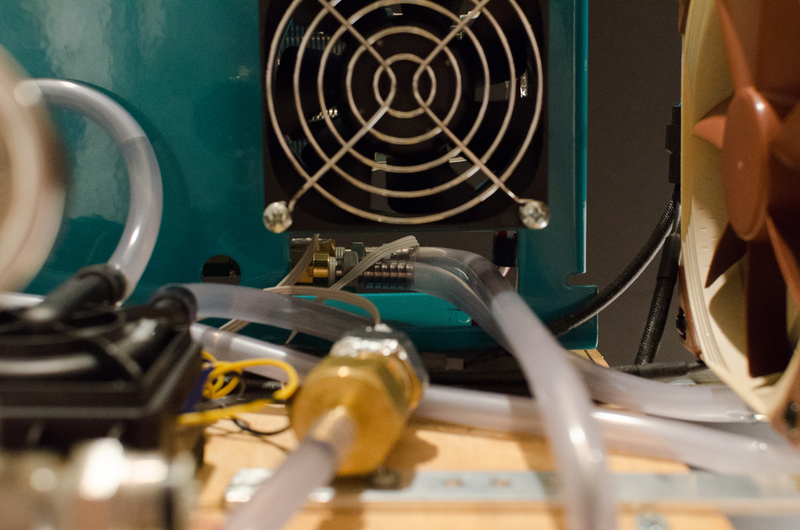 The existing prototype exhibits cold temperatures of about 8 degrees Celsius below room temperature on the gaseous CO2 return tube after it exits the heat sink, indicating an uncapitalized opportunity to absorb more heat from the refrigeration cabinet. Increasing the size and surface area of the heat sink would improve thermal performance, as did increasing the expansion tube size to ¼” and extending it an additional 150% in length in our second prototype to offer a larger area for heat exchange. Heat leakage in the cabinet itself stemming from the inexpensive commercial construction contributes quite noticeably to thermal inefficiency - improving the construction and insulation quality would reduce the necessary cooling power and operating interval of the compressor, and gains in both power efficiency and thermal efficiency would result. Integrating the compressor’s air-cooled pistons into the cogeneration system holds potential to recover an additional 30-50 watts of heated water from the compression process, as well as removing 20 watts of electrical consumption via eliminating the high-speed fan currently implemented. On the compressor side, the high-speed fan cools the CO2 pistons and the ½ HP motor, exhausting the energy as heated air. 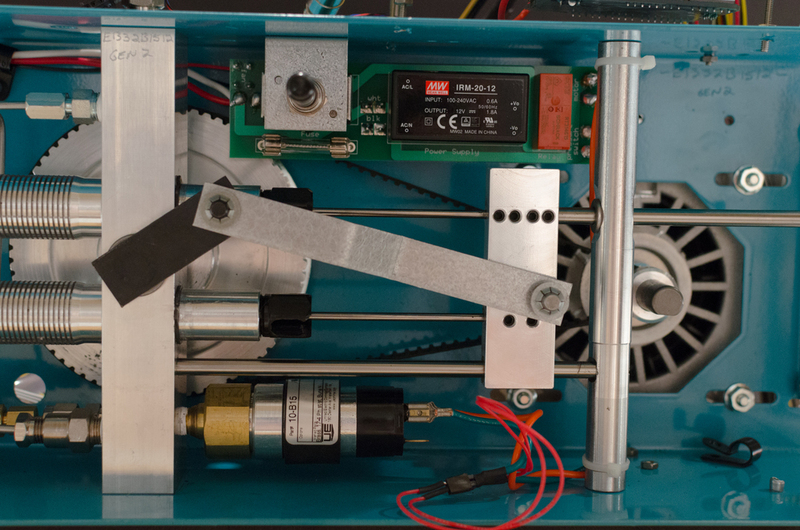 The motor only consumed 200W at peak load and 154W continuously in our design, while its maximum load specification details a 400W power draw. Utilization of a smaller, more appropriately sized or ¼ HP motor that operated in the ideal efficiency range would save 40-70 watts and eliminate the need for a dedicated cooling fan, further saving electricity and design complexity. Overall, the current configuration has provided substantial support for the viability of a CO2-based refrigeration system in domestic applications. There is significant room for improvement beyond the preliminary implementation that would narrow the performance gap between CO2-based and existing HFC-based refrigeration systems.